The delicious and classic Italian dessert in cake form. 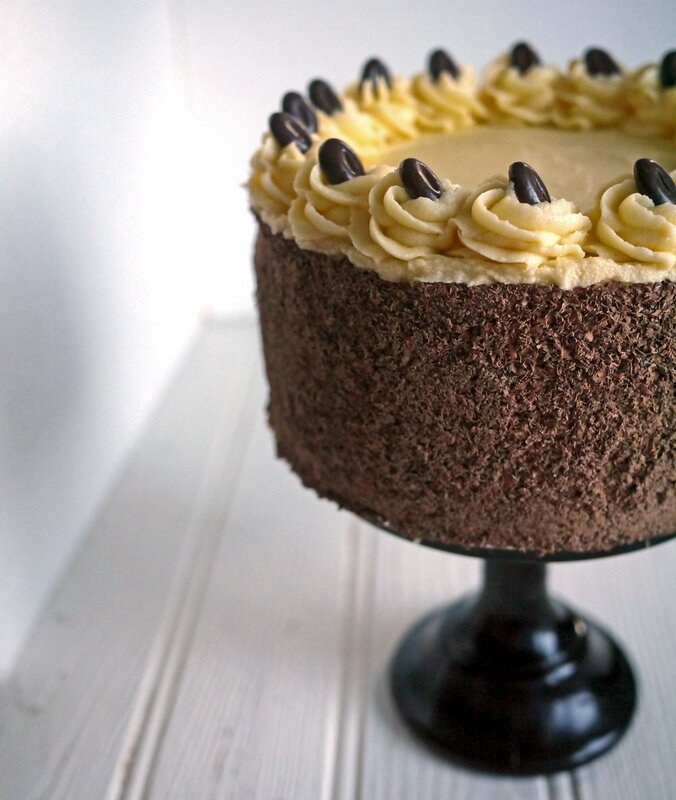 This Tiramisu Cake is layers of chocolate coffee and vanilla sponge, sandwiched with light, fluffy cream cheese buttercream icing, finished with chocolate shavings. What a teatime treat! Picture the scene.. It’s 1996, I’m 15, wearing black lipstick, listening to The Cure and writing cringingly bad poetry. I have a secret. A big secret. One dish stood out even more than all the others. The dreamy, creamy, light tiramisu. It was the height of cosmopolitan cooking, European, with booze in too! I loved making it. Seeing the eggs transform into this silky, cloud-like dessert never failed to secretly cheer me from my teenage angst. I made it at every opportunity. I still love and use that same recipe for tiramisu now, 18 years later. It was only a matter of time before the flavours made it into a cake and so I give you; Tiramisu Cake. The very kind people at Sugar and Crumbs had sent me some of their new flavoured icing sugars to try, one of which is coffee. I was really impressed with the delicate coffee flavour it gave the icing in the Tiramisu Cake. If you can’t get hold of this sugar, you can use normal sugar with coffee added (it’s explained at the end of the recipe). 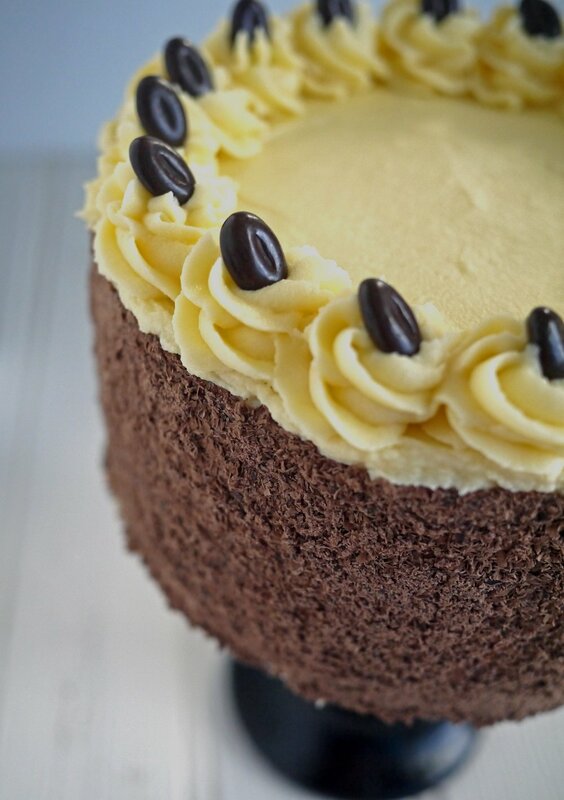 This delicious layer cake is a must for all Tiramisu or coffee fans. Grease 2 x 7″ round deep cake tins. Cream your room temperature butter with your brown sugar and caster sugar until it’s pale, light and fluffy. Mix in the eggs, one at a time, beating really well after each egg. Don’t worry if it starts to look a bit curdled, it’ll all come good. Mix in your flour. If you’ve been using a mixer, do this bit by hand. It helps to keep the sponge light. Pop one of your greased tins on the scales and weigh in 650g of the cake batter you have in your bowl (or just guess half). In a mug, mix together the cocoa, coffee and boiling water until dissolved. Stir this into the remaining half of the cake batter and put into the second prepared tin. Smooth out both tins of batter with the back of a spoon. Make a bit of a dip in the middle to account for rising. Bake for about 30 - 35 minutes or until a skewer comes out clean. You might need to adjust the time by 5 minutes either way depending on your oven. Meanwhile make your icing. Beat your butter until it’s pale, light and fluffy. Beat in your icing sugar. Beat for about 10 minutes until light and pale. When your cakes are completely cold, use a carving knife to level them. Trim the top crust off. This is important, it’s not a waste of cake (taste testing compulsory). If you don’t do this, with a cake this size it will be wonky. Then split each cake in half horizontally, so you'll end up with 4 layers of cake. Sandwich each layer together (alternating the sponge types) with your buttercream, and a layer on top. 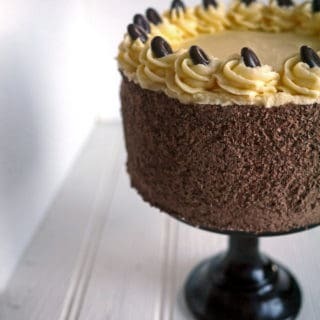 Cover the sides of your cake with buttercream, then roll in the grated chocolate. 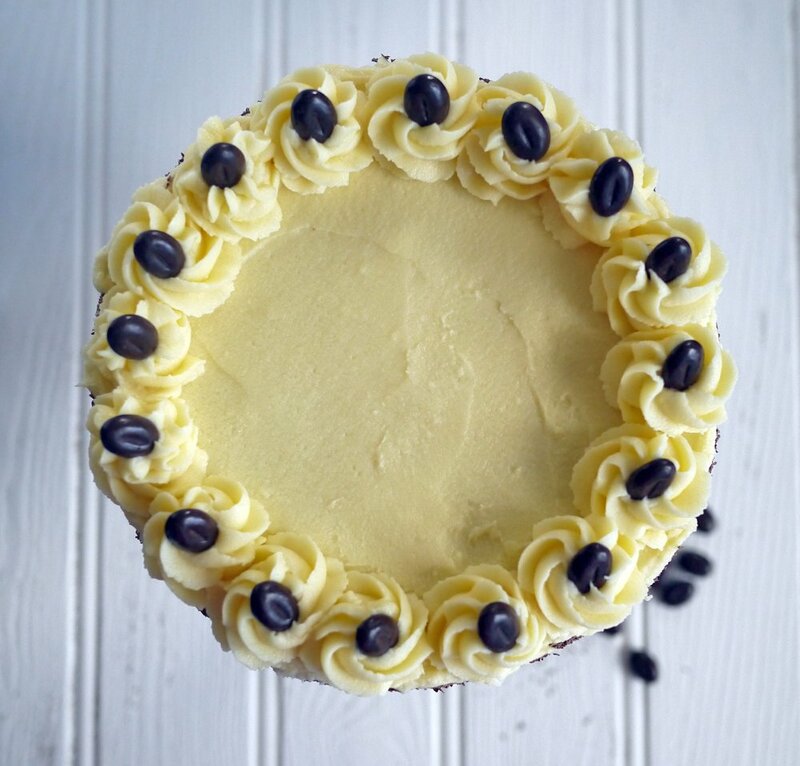 Now cover the top of the cake with more buttercream, pipe swirls and add your chocolate coffee beans. * Or 500g normal icing sugar and 2 tbsp of instant coffee dissolved in 1 tbsp of boiling water. See my note above about the icing sugar. What’s your oldest cookery book and your most loved recipe? What were you cooking when you were 15…? I was no cook at 15, in fact it took me a few years before I got interested in cooking at all. That said, the first ever cookbook I bought was Mary Berry’s Complete Cookbook. It’s a whooper of a book and has a photo of each recipe, most important in my opinion. It now sits proudly amongst my huge collection of cookbooks. 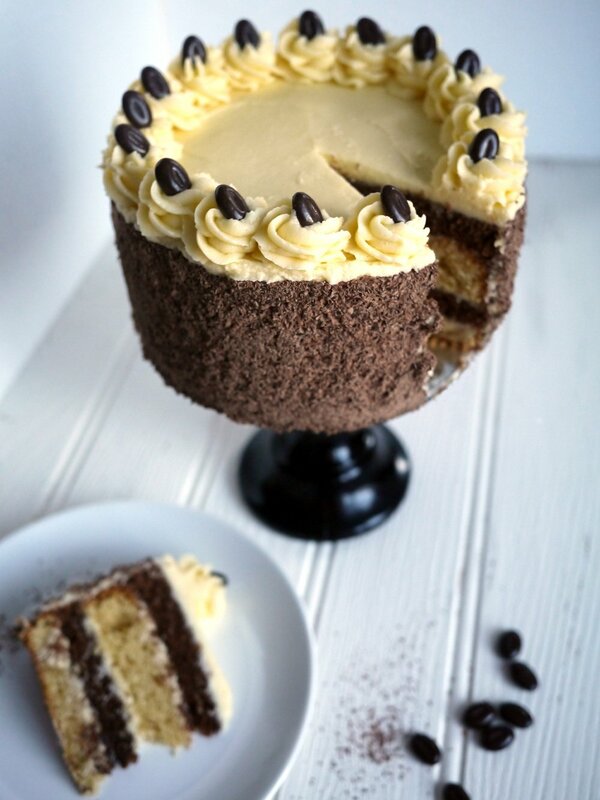 I digress, your Tiramisu Layer Cake looks fabulous and your photos are stunning. This is my kind of cake. Please send over a slice. Thanks Julie. We’re recipe book twins!! Perhaps we should try and cook our way through it?! I remember too at the age of around 14/15 (around 1982) drooling over a Hamlyn cookbook which I thought was simply magical due to the square pictures of each dish (what it SHOULD look like when finished) in all it’s brashly coloured glory. It always struck me that the savoury dishes looked odd but oh my, the cakey section was sublime!!! Good old Hamlyn! I’m sure they still do cookbooks now actually! The oldest cookbook that I still use is my school ‘Domestic Science’ book that we painstakingly copied the teacher’s typed-up recipes into about 30 years ago. It’s held together by an elastic band & has all sorts of bits of paper tucked inside, but it’s still my first choice for basics like scones & pastry! I made the cake last night for my friends at my Jamie at home party. Everyone who had a slice agreed it was delicious. Unfortunately, I have some frosting left over, so I’m going to use the chocolate sponge to make a traybake for colleagues tomorrow. Just one question. When I added the cream cheese to the frosting it went quite runny, and I had to add extra icing sugar. I used own brand full fat cheese from a supermarket; do you think it may have been better to use a branded one? Thanks in advance. I love your description of yourself age 15 – could have been describing myself: black lipstick and stolen graph book from the school stationery cupboard full of bad poetry under the bed! My strongest memory of a cookbook from childhood was the Brownies and Girl Guides cookbook, I think I made the melting moments from that about a hundred times. I didn’t discover Mary Berry until a few years later. This looks incredible! 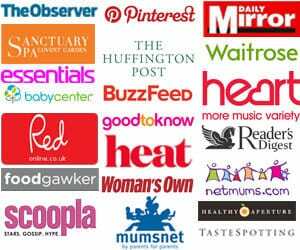 I am pinning it, sharing it and hopefully making it very soon! This looks great, just the sort of cake I go for in the patisserie, gorgeous! Stunning cake, bypassed baking in my misspent youth and catching up now! THANK YOU! I love love love tiramisu and just had to try out your recipe, my cake tastes divine and is HUGE! This could be my new favourite recipe! Be still my beating heart, this looks utterly drool worthy! Thank you so much for linking up to it in this months Tea Time Treats, if there was a prize I’d give it to you right now! What a beautiful cake. Tiramisu in cake form? Sounds perfect!! Could I halve the recipe and bake the four layers indivually in 7 inch sandwhich tins rather than cutting the cake at the end? If so what would be the baking time? I need this in my life, it looks delicious!